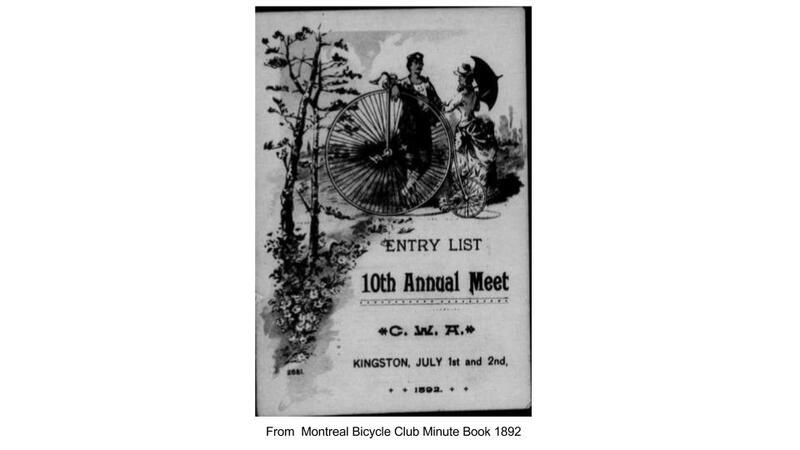 This webpage is based upon a talk on the Montreal Bicycle Club and the early history of cycling in the city given at the Atwater Library May 18, 2017 as a part of their Lunchtime Series. Thank you Lynn. 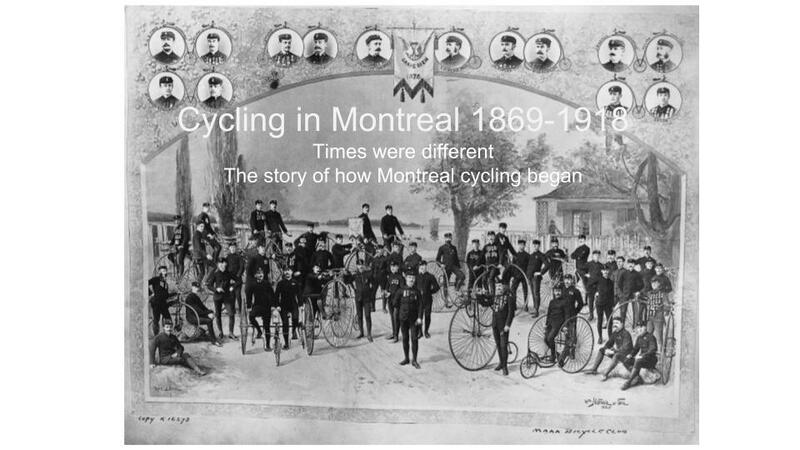 Welcome everyone to my talk on the Montreal Bicycle Club and the early years of cycling in this city. This club was founded in 1878 and by the time of the worldwide bicycle craze of the 1890’s was one of the best known bicycle clubs on the continent. However today it’s history is largely forgotten. How it is that I, with no personal connection to this club became aware of its history requires a bit of explanation. 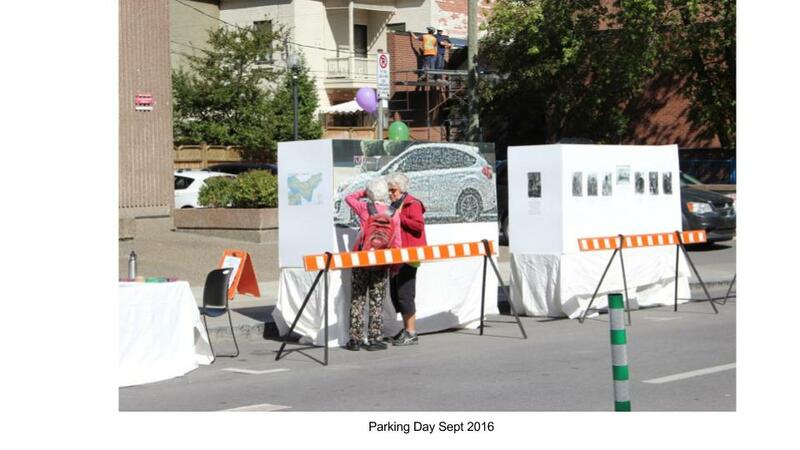 I am a member of the Westmount Walking and Cycling Association, and last year we decided to take part in Parking Day. This is an annual worldwide event, in which groups rent a street parking space, and put to some use other than parking a car. Typically the parking spots are converted into to miniature green spaces. We decided to display a photo mosaic of a parked car. 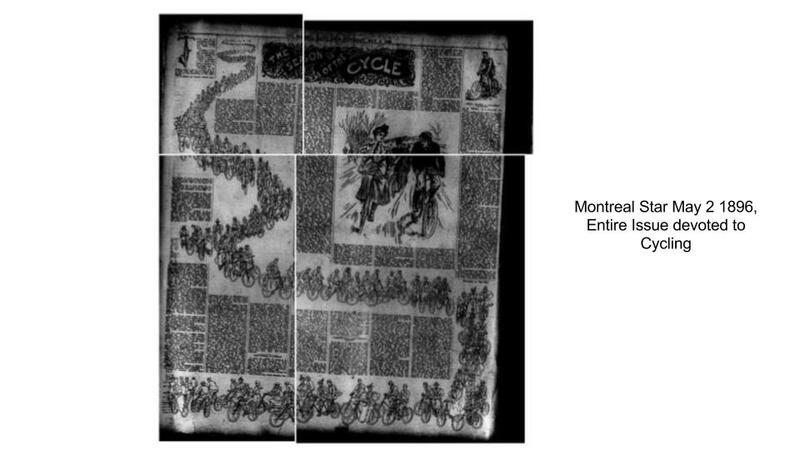 The car mosaic was comprised of hundreds of small photos of cyclists in and around Westmount. As it happens, instead of a single parking space, we were assigned two adjacent spots. For the second spot we exhibited photos of cyclists from Montreal’s past. We used 19th century Notman photographs from the McCord museum, and displayed them alongside our car mosaic of current cyclists. Quite a contrast. The display on the left is the photo mosaic, the one on the right has the historic Notman photos. While preparing the display I stumbled on a website made by Chris Houston. 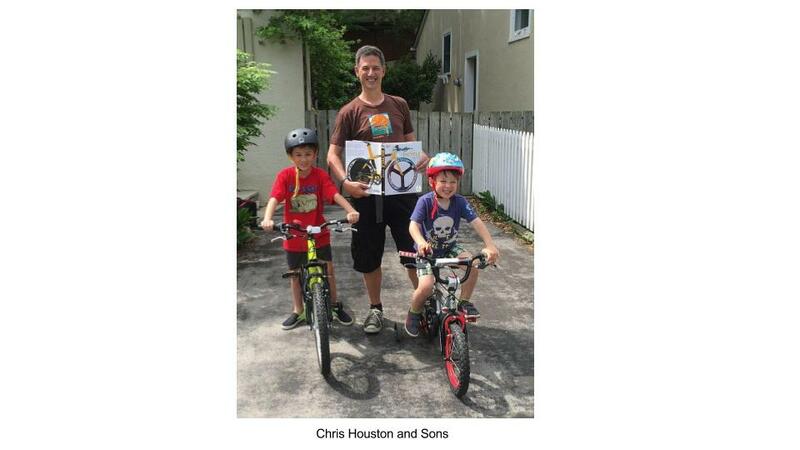 Chris is a great grandson of A.T. Lane, one of the founders of the Montreal Bicycle Club. His site briefly describes how his ancestor A.T. Lane was the first person in North America to ride a bicycle. That statement set a spark of interest in me. 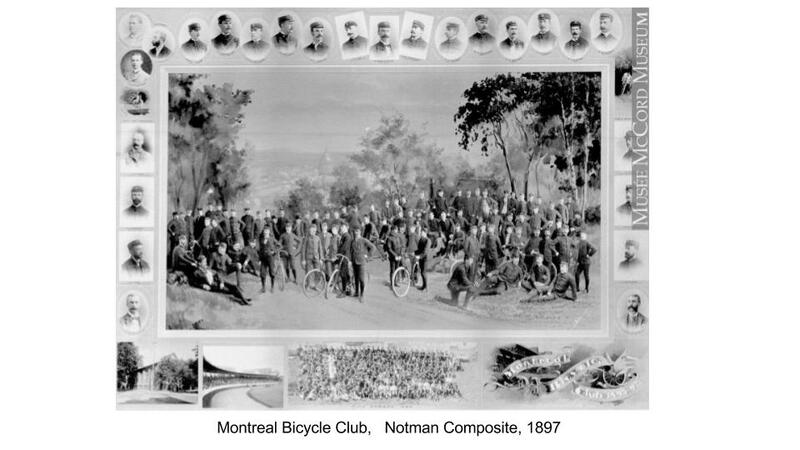 Who were the people in the Montreal Bicycle Club and what was their story? In my search for clues, I came into contact with Don Houston, uncle of Chris and a grandson of that original founder. 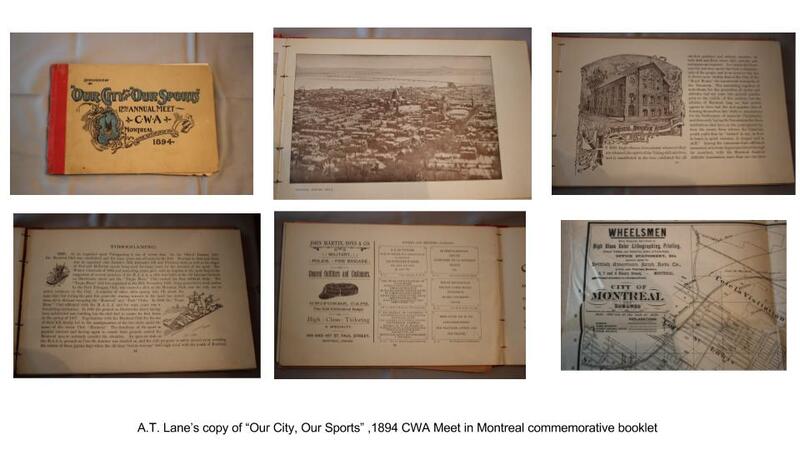 Doreen Lindsay of the Westmount Historical Society, also directed me to a book on the history of the Montreal Amateur Athletic Association (MAAA) written for its 1981 centennial. 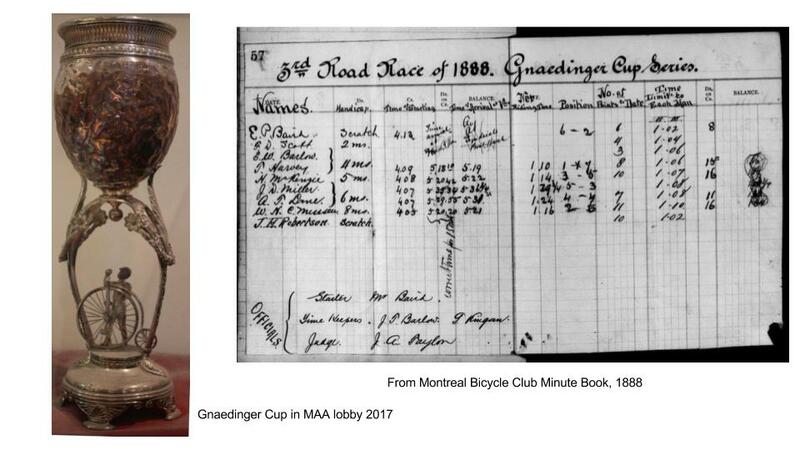 In addition there are two books by Glen Norcliffe, who is Canada’s premier cycling historian, both of which describe the history of the club. These books led me to the National Archives in Ottawa to look up the Montreal Bicycle Club Minute Book, and ultimately to the building of a website on the subject. 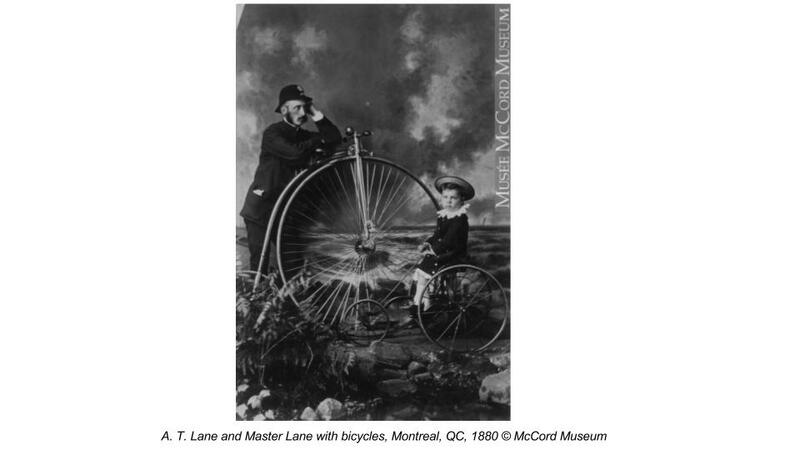 This talk is about the early history of cycling in Montreal, however the bicycle did not arrive in this world as a single invention. There were many forms before the modern style “safety bicycle” emerged in the 1890’s. 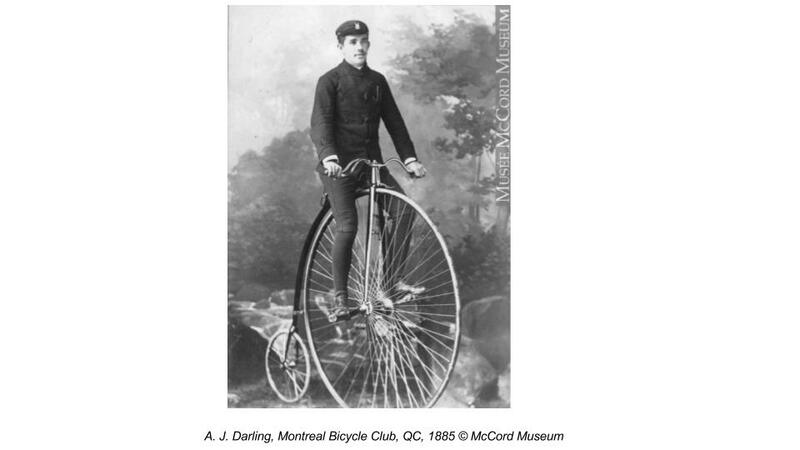 Montreal did not invent any of these early bicycles so I will give short general overview of the bicycle along with the specific Montreal history. The earliest bicycle, was invented by 200 years ago by Baron Karl Drais in Mannheim Germany 1817. The machine became known as a hobby horse, or dandy horse. One rode it Fred Flintstone style, and for a few years it enjoyed a brief popularity in many countries. 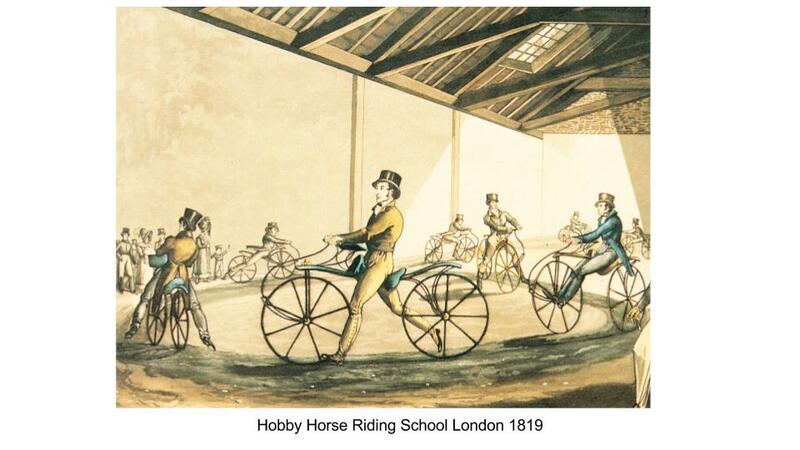 Riding schools were set up in various cities such as London. The roads were so rutted that people took to riding on sidewalks. This led to various bans of the machine in Europe, the United States and even Calcutta India. I am not aware of any Montreal references to these early machines. “The ice-velocipede has but one wheel armed with short spikes which catch in the ice and considerably lessen the chance of slipping. The hind wheel is replaced by two small runners placed side by side, a few inches apart, and connected to the body of the machine with a stout iron bar. The manipulation of the ice velocipede is the same as an ordinary bicycle. 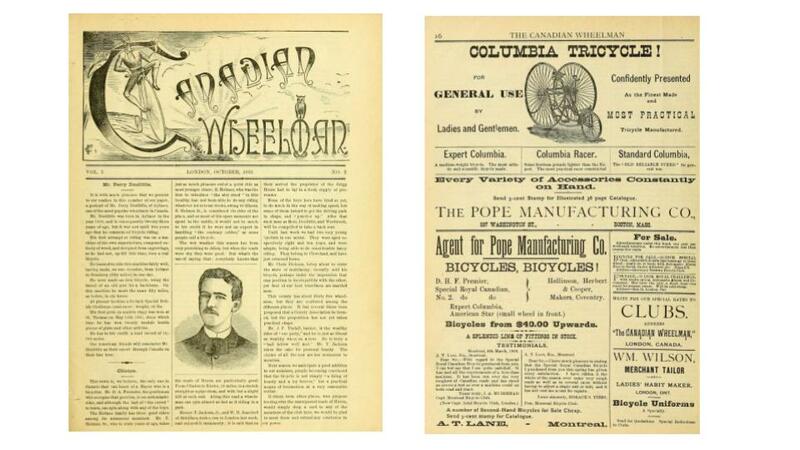 The Velocipede was still a heavy, slow, machine and it’s popularity also soon faded. 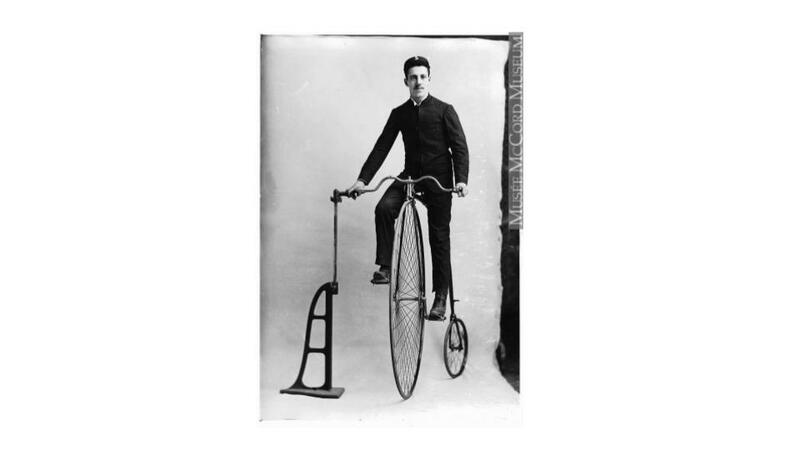 Although the wire spoke wheel had been invented in the early 1800’s, Eugene Meyer of Paris was the first to adapt them for use on a bicycle in the late 1860’s. These wheels were lighter and stronger than the previous wagon wheels used before. 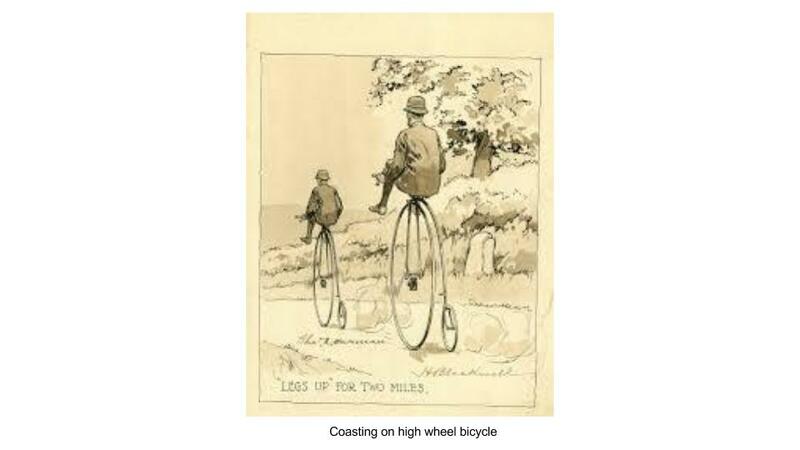 The Penny Farthing, or High Wheel bicycle as it was called at the time, with it’s large front wheel and a seat almost 6 feet above the ground was born. 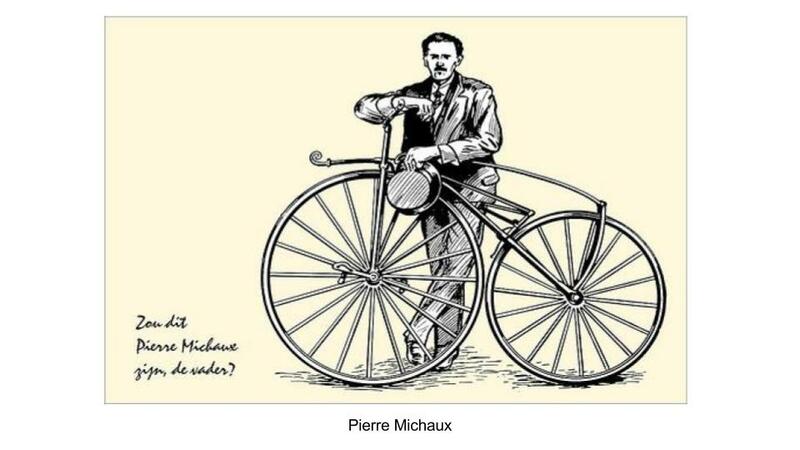 High wheel bicycles were invented in France, just before the Franco Prussian War, but England was the center of the industrial revolution and much of its later development occurred there. James Starley of Coventry, after seeing one of Meyer’s machines, made many incremental improvements to the same basic design. He is now regarded as the father of the British cycling industry. 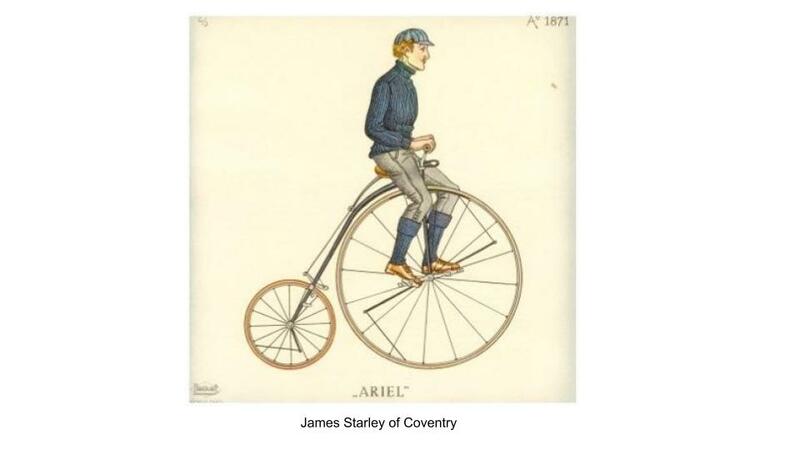 In 1871 Starley rode one of his Ariel style bicycles 100 miles from London to Coventry. He started at sunrise, and arrived at midnight. Now picture the sensation this man created, riding high above the ground, on primitive road surfaces and at high speed. 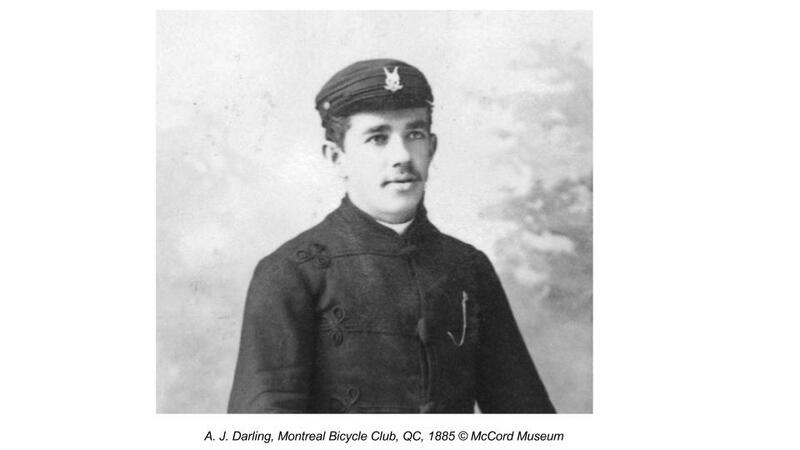 Three years later, in Montreal, on July 1, Dominion day, 1874, A.T. Lane, an immigrant from Liverpool, first rode a high wheel bicycle from Coventry, England. He worked for an importer, and from then on began bringing bicycles and tricycles from England to Canada for resale. 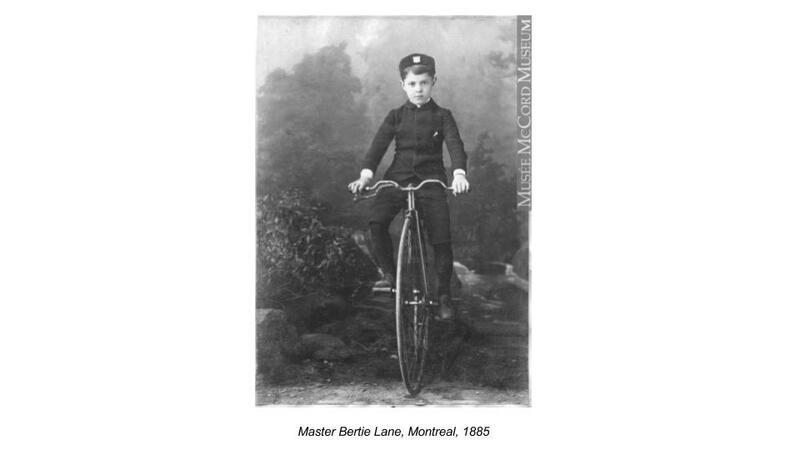 This Notman studio photograph was taken in 1880, 6 years after A.T. Lane’s first ride in Montreal. His son Bertie, mounted on his tricycle, would have been only 3 years old. 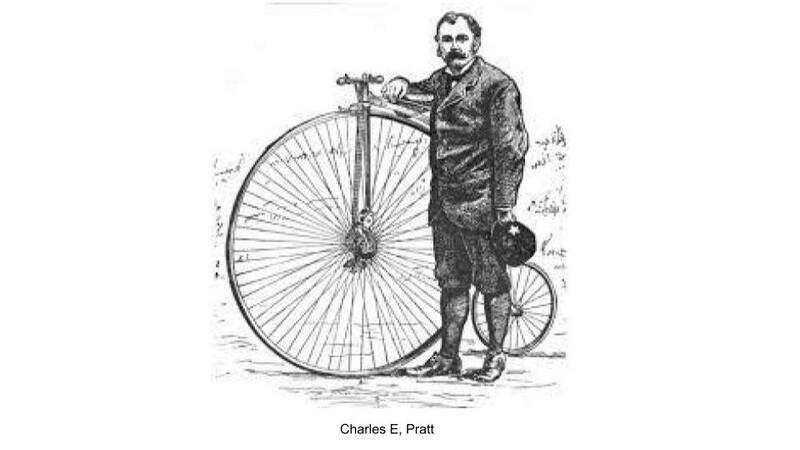 Karl Kron’s 1887 book 10,000 miles on a bicycle credits A.T. Lane as the first person to ride a high wheel bicycle in North America. 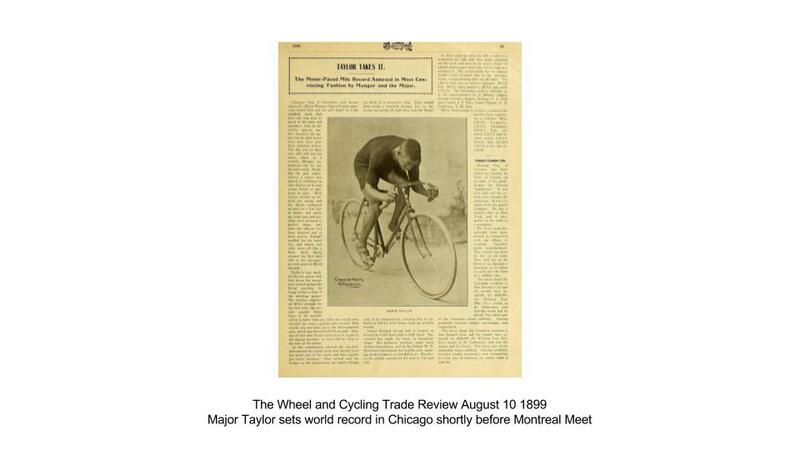 "Indeed, the first trail made on this continent by the rubber tire of a modem bicycle is accredited to A. T. Lane, one of the founders of the Montreal Bicycle Club who imported thither a 50 in. Coventry in season to take his first ride July 1, 1874." 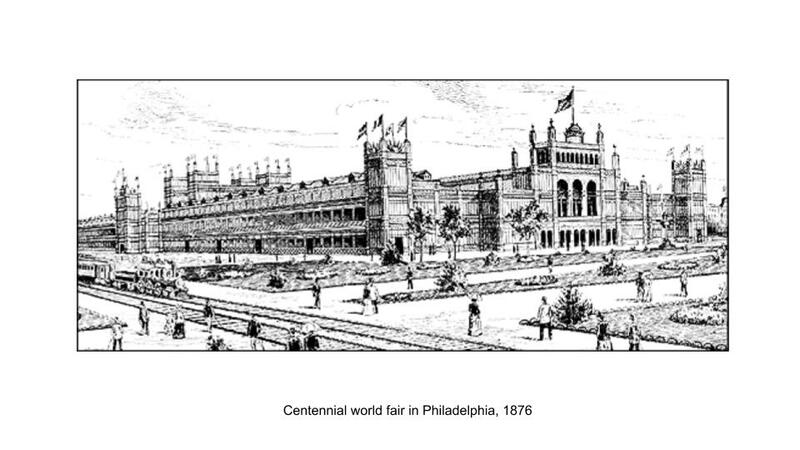 The High Wheel bicycle was not widely known in North America until 2 years later when it was exhibited at the Centennial world fair in Philadelphia, 1876. 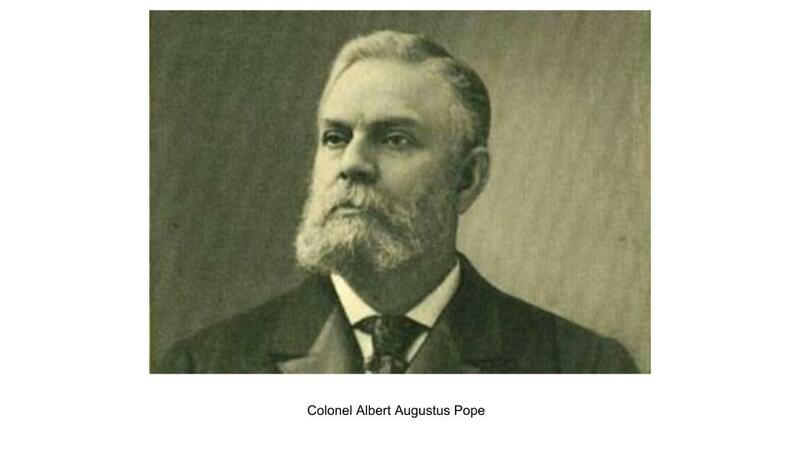 Colonel Albert Augustus Pope, a civil war veteran saw some of the English High Wheel bicycles at the exhibit and also began importing them. 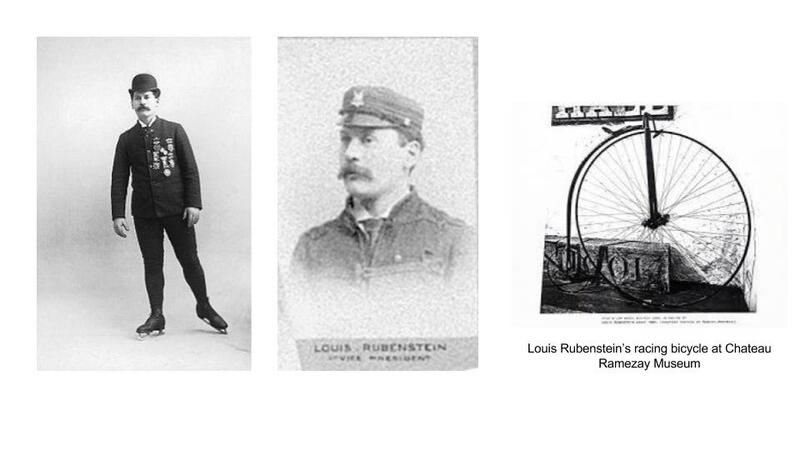 Later he founded the Columbia bicycle company in Hartford & Boston, becoming America’s most successful bicycle manufacturer. 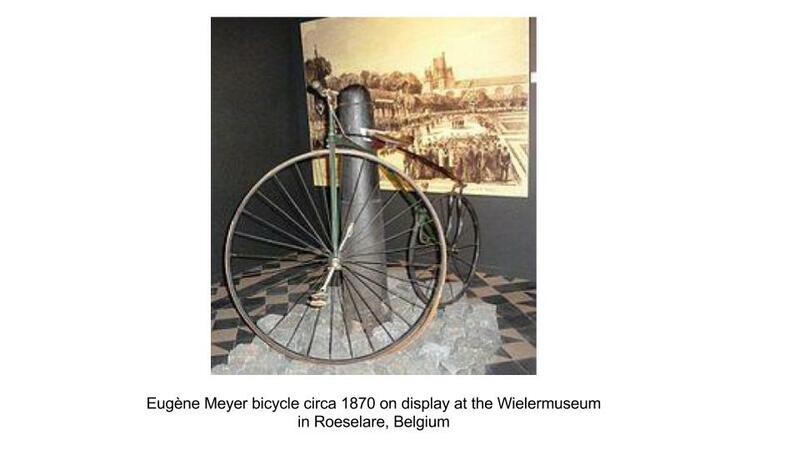 The high wheel bicycle was a sensation and inspired the a wave of new bicycle clubs and organizations. The first club in North America in Boston, in Feb 1878, followed by Bangor Maine. These first two clubs were both founded by patent lawyer Charles E. Pratt. 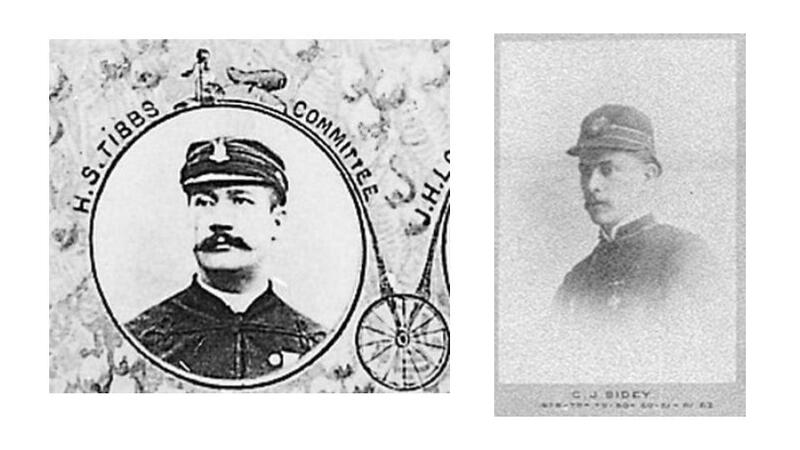 Pratt, the patent lawyer and Pope, the civil war veteran turned bicycle manufacturer met in Boston and joined forces. 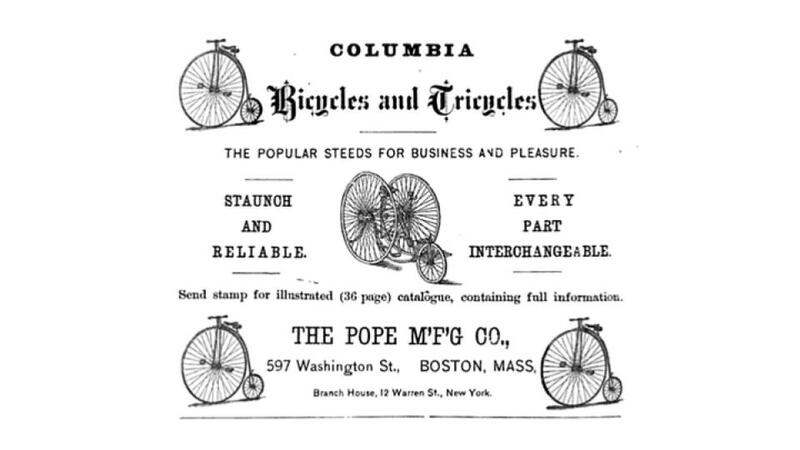 As Pope’s business grew Pratt became an employee and together they promoted cycling in America by founding of bicycle clubs, publishing a sporting journal called Outing magazine, and the creation of the League of American Wheelmen. Since Pope was a civil war veteran, and bicycles were thought of in terms of being “iron horses” they thought that bicycle clubs should be run similar to the military cavalry. 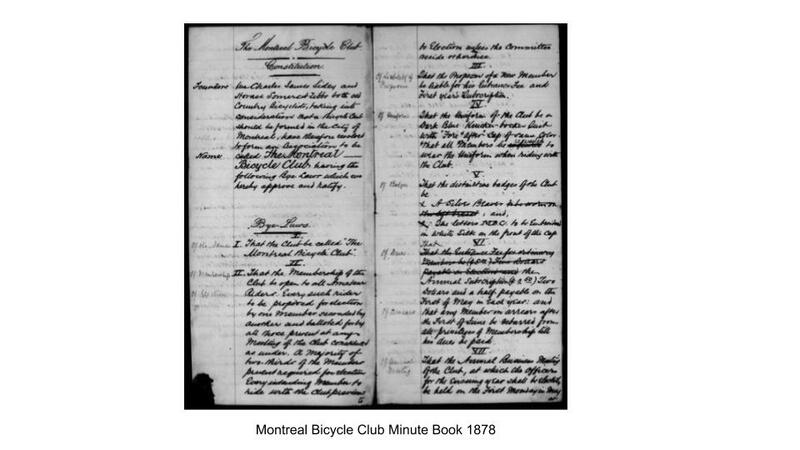 The Montreal Bicycle Club minute book begins with the sentence. "On 2 Dec 1878, Messrs C.J. 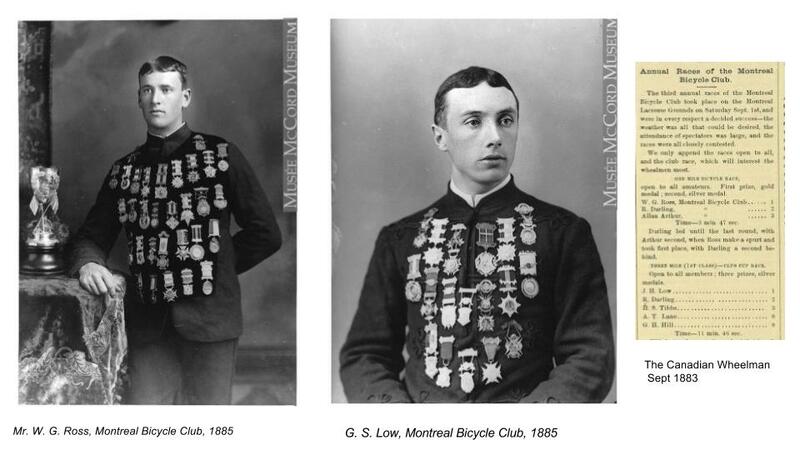 Sidey and Horace A. Tibbs met by appointment at the house of the latter, 33 Chomedey Street in Montreal, and proceeded to the business of forming a bicycle club." Both these men were immigrants from the United Kingdom. Tibbs had previously taken a 300 mile bicycle tour of England, Sidey had been president of the Edinburgh Amateur Bicycle Club. The following week A.T. Lane’s name was added as an additional founding member. There is a bit of a mystery as to why A.T. Lane was included as a founding member only after a week. He was the proprietor Canada’s main bicycle shop, and it is possible that Tibbs and Sidey were front men for his business enterprize. The club published its founding in various newspapers and the following month received a letter of congratulations from Charles Pratt along with a copy of the Boston club’s by-laws and regulations. 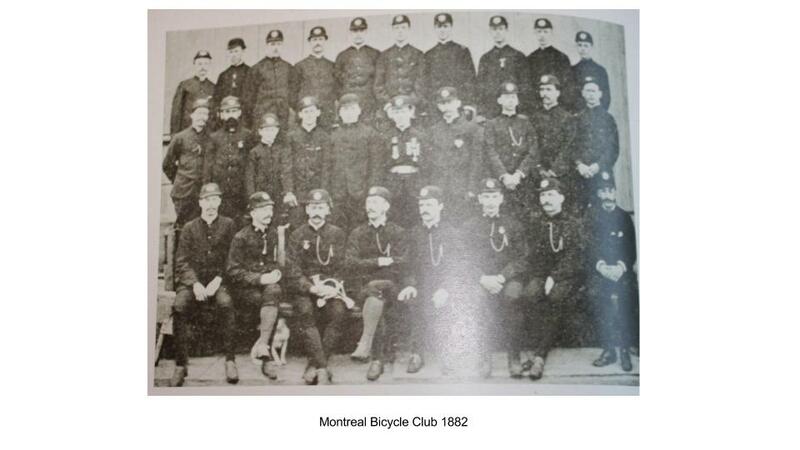 The Montreal Bicycle Club had both a British and American understanding of how a club should be run. This later becomes an important issue to 19th century cycling. It’s interesting that the rule was included at a time when cycling was in it’s infancy and no professional riders even existed. 3. The riders were to be given ranks; Captain, Lieutenants, buglar, flag bearer and whipper in, whose role it was to pick up stragglers. 4. The rides were to be in formation, no going ahead of the captain without permission. There was also a system of whistles to notify when ride in single file, two abreast, dismount etc. 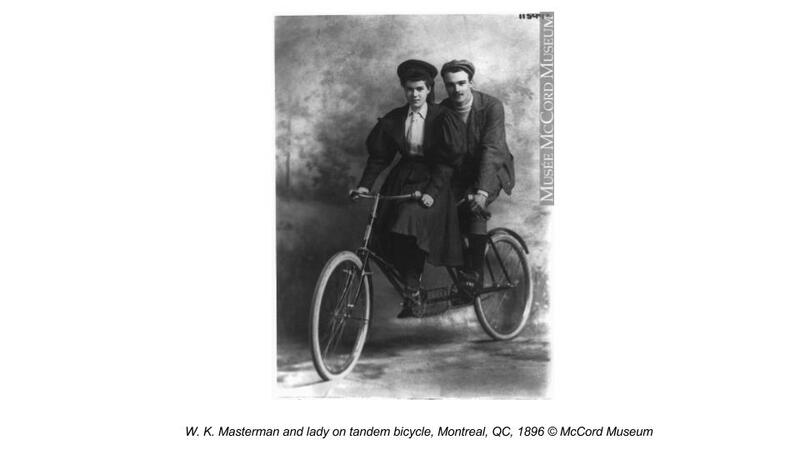 These Notman studio photographs of people posing on bicycles were of course staged set ups. If you look closely at the uniform may notice the winged wheel symbol on the cap, which was introduced in 1885. Many bicycle organizations used winged wheel symbols at that time. 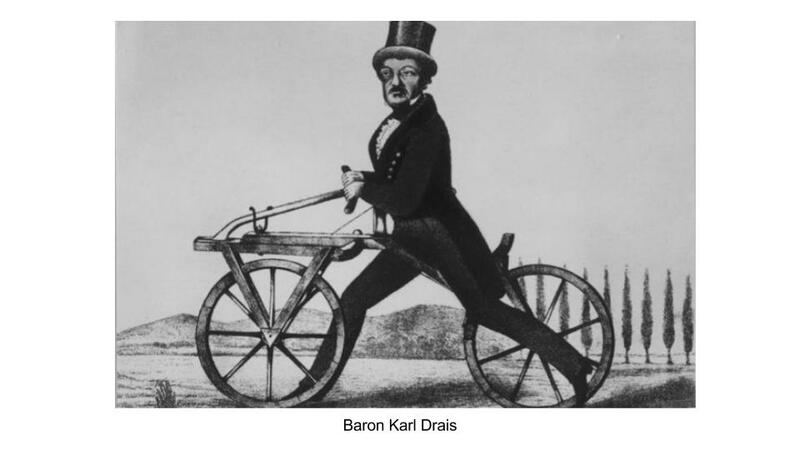 Perhaps like Karl Kron they believed that riding high wheel bicycle gave a feeling of flight. 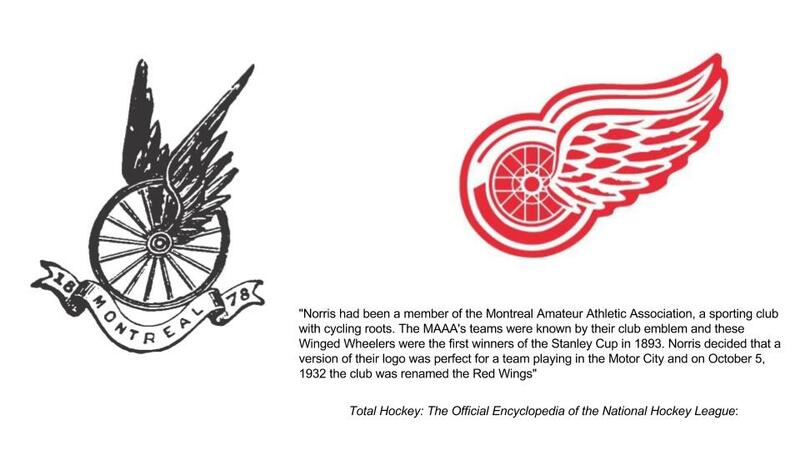 The Detroit Red Wings symbol is a direct descendent of the early symbol used by the Montreal Bicycle Club. 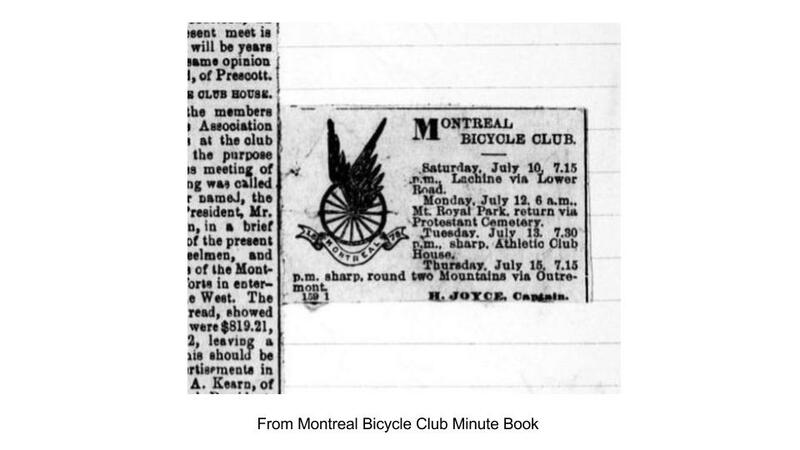 The club members had a close connection to the Montreal Lacrosse Club and in these early years they used the Lacrosse Grounds on the west side of Crescent street between Ste Catherine and Sherbrooke for cycle training and holding races. This early cycling venu is now bisected by the de Maisonneuve Bicycle Path as it passes by Concordia University. 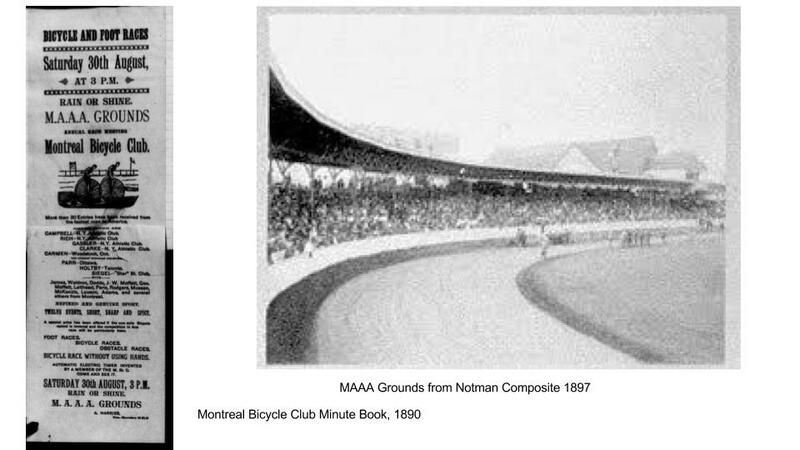 The Montreal Bicycle Club held annual races on these grounds starting in 1880. Many of these early races were won by W.G. Ross or G. S. Low. Club events such as rides. races, parades, and social excursions were published as Fixtures in newspapers and clippings were kept in the minute book. The club kept accurate records of the rides, their attendance and distance travelled. They had about 3-4 fixtures per week from May to October. A typical ride would be to Lachine, around the mountain or to the back river. The riders placed an emphasis on putting on a “good show” and would move in tight formation, all high above the onlookers, at human powered speed never seen before. Bicycle bells would automatically ring after every so many wheel rotations to draw attention to the riders. 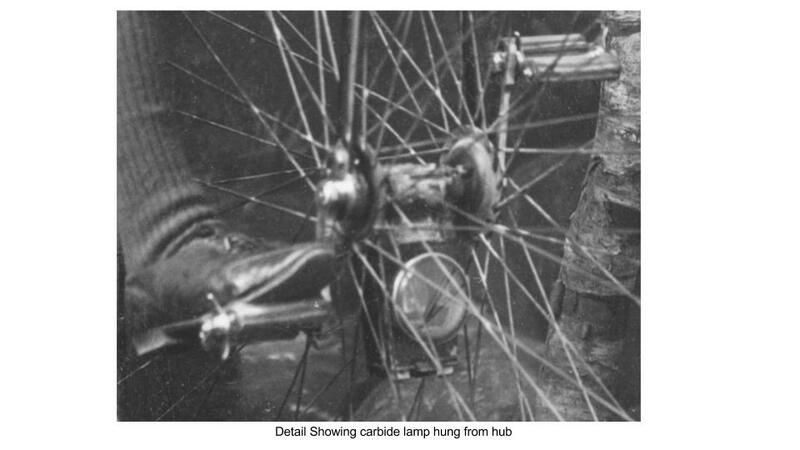 The bikes were also equipped with carbide lamps, suspended from the front hubs by leather straps for night time riding. Chinese lantern bicycle parades were also popular. 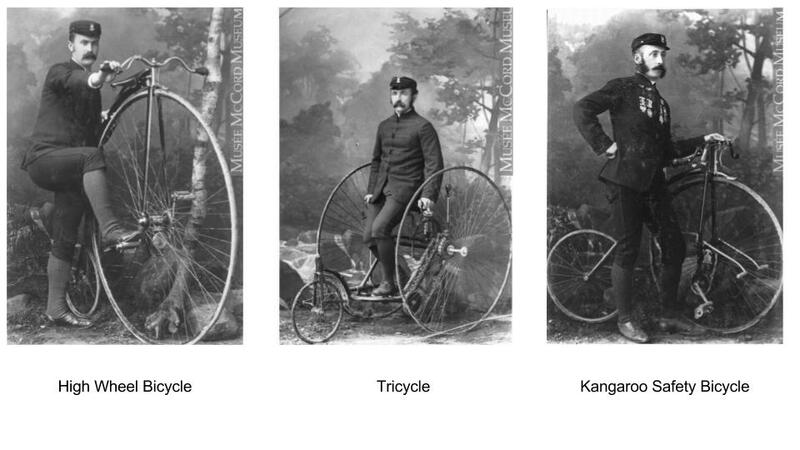 High Wheel bicycles, in addition to being fast, were also expensive, difficult to ride and very dangerous. In order to mount the machine, one would run alongside, then climb up on the peg to reach the seat. To dismount, one slowed the machine by applying back pressure to the pedals, then climb back down onto the peg before the machine stopped. Headers, going over the handlebars were common occurrences. When going downhill, the bicycle might go so fast that one’s feet could not keep up to the pedals. The recommended practise at this point was to put your legs over the handlebars and coast. That way, if a header occurred, there was a better chance you might be thrown free from the bicycle. Cycling in the high wheel era was a risky sport undertaken by wealthy athletic and daring male riders. The first club photograph from 1882 includes a bugle and the club mascot. Sometimes, on excursions, they carried the club Dawg with them, noting that he would fearlessly “ride like a man”. The MBC joined other organizations shortly after its founding. First the LAW in 1880. 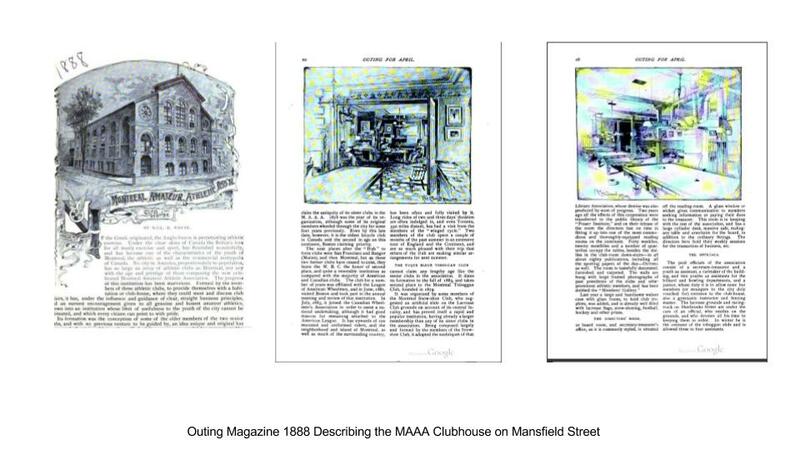 Then next year, in order to purchase a combined clubhouse on Mansfield street, they joined with the Montreal Snow Shoe, and LaCrosse clubs to form the MAAA. 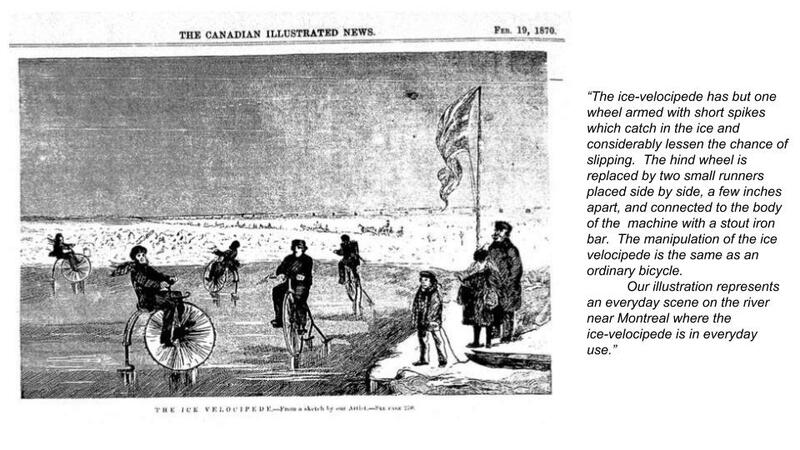 Finally in 1883, after a year’s hesitation, they came on board with the Canadian Wheelmens Association. The CWA published a monthly journal and organized annual “Meets”. The host city would invite members from across the country to come and join them for a series of events held over the Dominion day weekend. 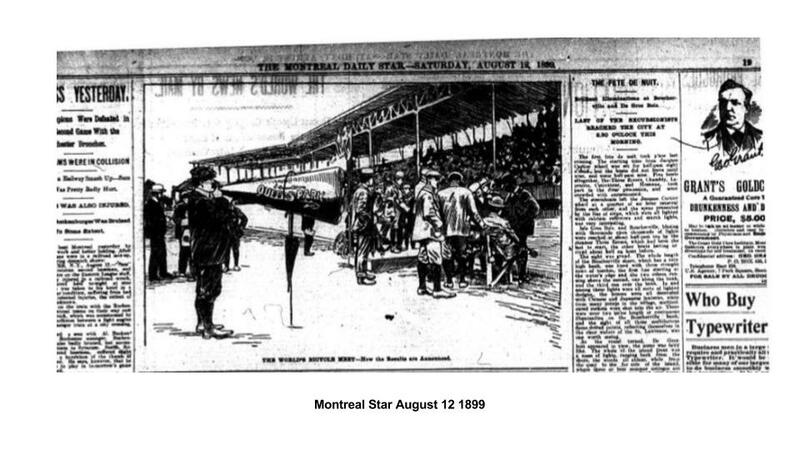 Montreal first hosted the Meet in 1886, then for a second time in 1894. Every year the MBC would send a delegation to the annual Meet and arrange special prices for rail transport to that host city. The Meets had bicycle parades through the host town, followed by a series of track races, road races, musical rides, or demonstration polo matches. Because of the High Wheel's danger and difficulty in riding, tricycles or an early form of safety bicycle known as the kangaroo were also used. 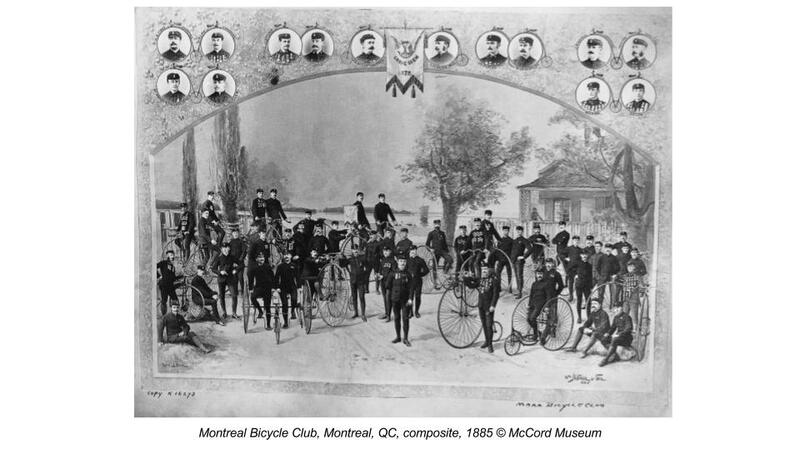 During the elite High Wheel bicycle era, the Montreal Bicycle Club was a small yet well known club, one of the oldest in North America. They wore distinctive uniforms at all public events. As a part of the MAAA, they owned one of the best sporting clubhouses in North America. Track races were held at McGill, the Lacrosse grounds or the Blue Bonnets horse track which at that time was located near the present Montreal West train station. Handicap track races were popular, weaker riders starting ahead so that everyone might finish at the same exciting moment. On June 15, 1887 a penny farthing hill climbing competition was held on Cote des Neiges. Some of the best riders from the Montreal Bicycle Club attended, yet all were defeated by the hill, except one plucky, small, 10 year old, boy, Bertie Lane. It was reported at the time that just below the crest of the hill, his little legs seemed to stop momentarily, and ere the conveyance might topple over, suddenly he was at it again and had accomplished the ascent in 10 minutes, 20 seconds. In 1888, the 10th anniversary of the club’s existence, a magnificent silver cup for road racing was donated by Mr Gnaedinger. It now is housed in a glass case in the MAA lobby. Road races were held between downtown Montreal and Lachine or Pointe Claire. 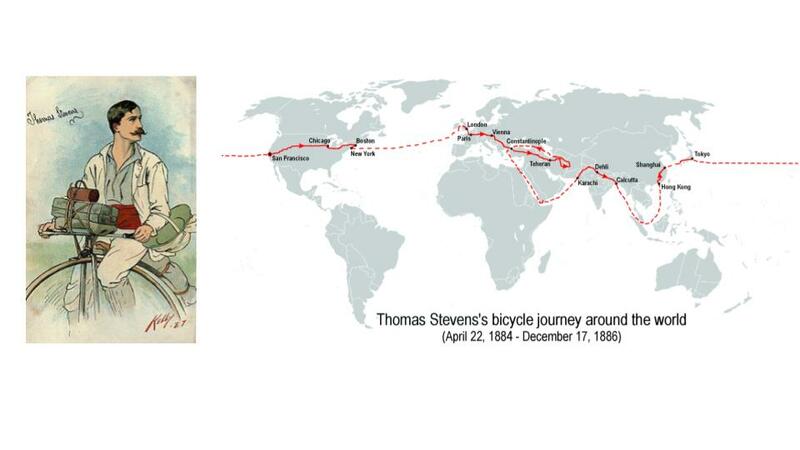 During this high wheel era, epic travels such as Thomas Steven's round the world trip 1884-1887 were widely reported upon. Members of the Montreal Bicycle Club were spokespersons for cycling and it was expected that they be aware of Steven’s progress around the world and be ready to discuss it. IIn the same year, 1884, a more modest yet still impressive long distance bicycle trip was recorded by the Canadian Wheelmen’s Association. 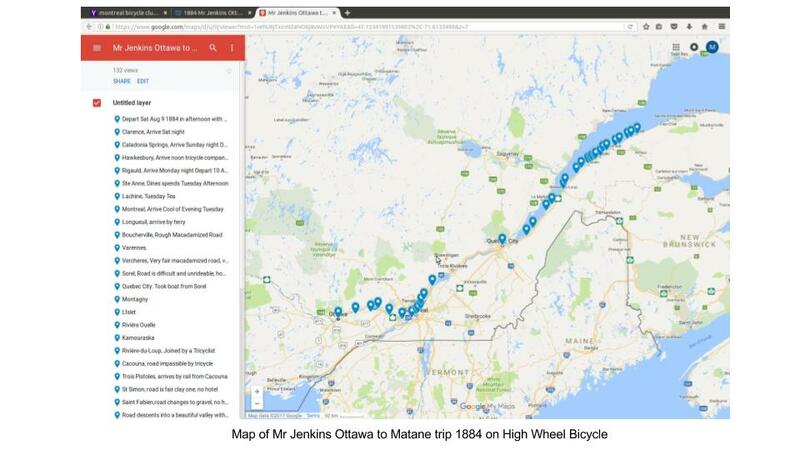 A Mr Jenkins from Ottawa passed through Montreal on a high wheel bicycle trip to Matane Quebec. Trips such as these were reported in the monthly journal of the Canadian Wheelmens Association or in special editions called road reports. However the Montreal Bicycle Club lacked a dedicated quality track for cycle racing. 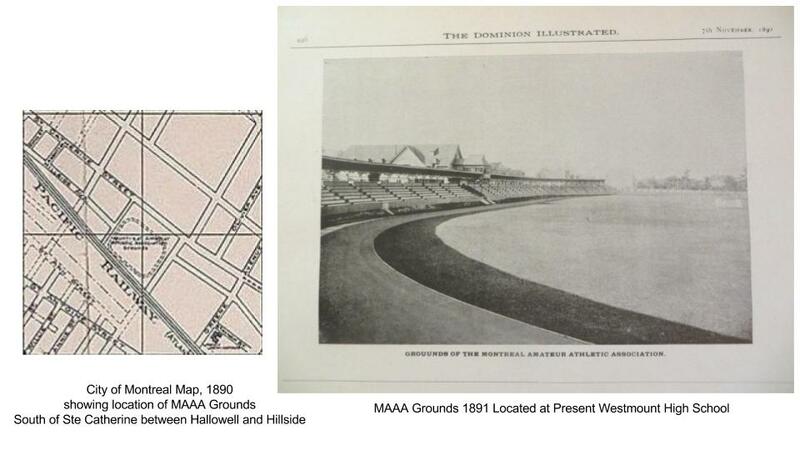 In 1887 the Lacrosse grounds were sold and the following year the MAAA grounds were constructed with a state of the art banked cinder track, an electric timing system, and viewing stands for 3000 people. This was built where the present Westmount High School stands. This location became the principal track racing site for the MBC. On August 30, 1890 the MBC first held a series of races at MAAA grounds, inviting racers from the New York Athletic Club as well as various towns from across Ontario. The opening of the MAAA grounds coincided with the introduction of the safety bicycle. This is the modern bicycle with two equal sized wheels and a chain driven rear wheel. All over the world, interest in cycling exploded. 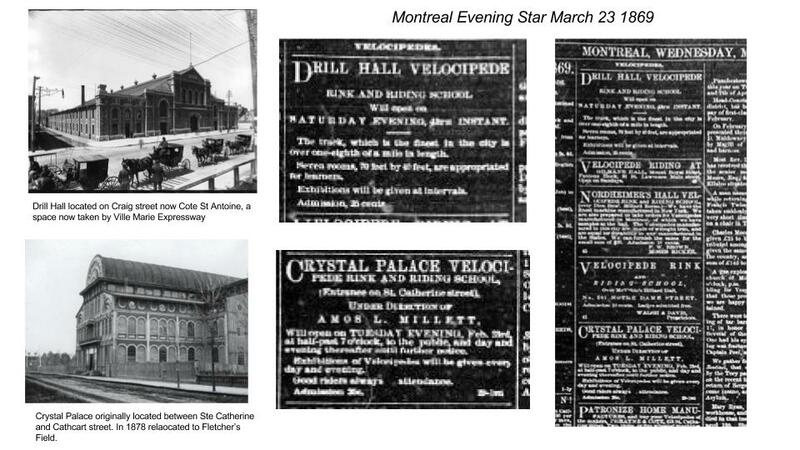 In Montreal an entire issue of the Montreal Star was devoted to cycling. 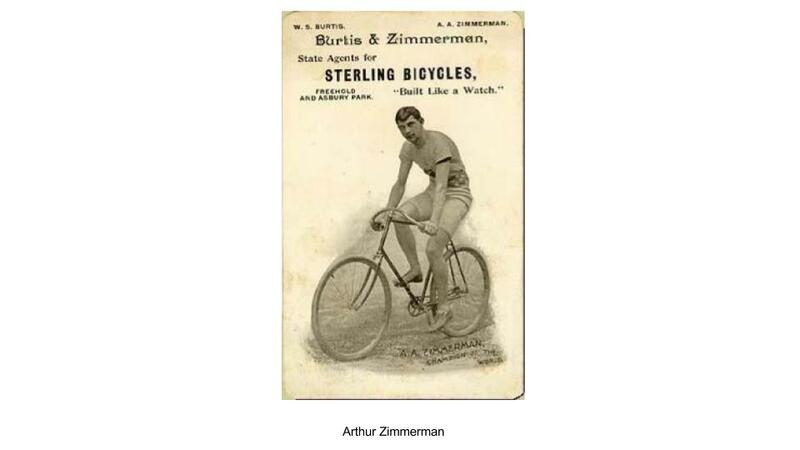 By the mid 1890’s the League of American Wheelmen had approx one hundred thousand members, there were hundreds of bicycle clubs throughout the continent, and American bicycle racing champions such as Arthur Zimmerman were household names. Zimmerman today is best remembered for the controversy he created when he competed in England as an Amateur despite the fact he had received valuable non cash prizes for different competitions. Endurance events known as Six day races were held at Madison Square Gardens in New York and attracted huge crowds. 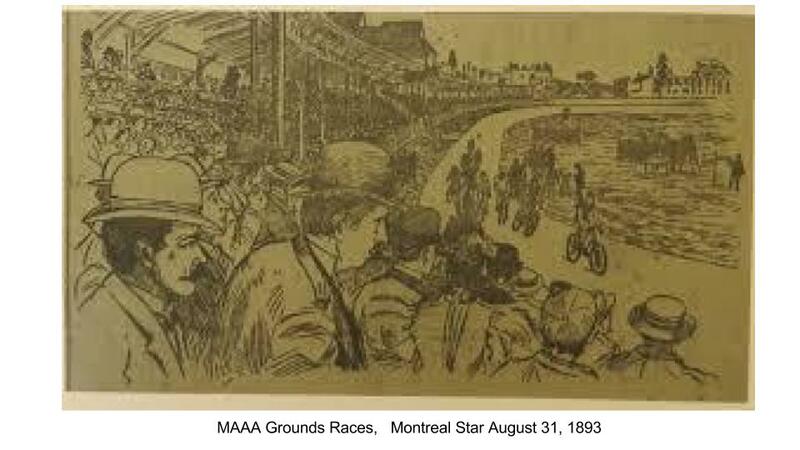 Bicycle racing events at the MAAA grounds were also widely attended as can been seen in a Montreal Star newspaper sketch. Pictures of the crowds can also be seen in details from the 1897 Notman composite photograph. Here a chance meeting between ZImmerman, the cycling world champion, and a young Black trick, or fancy rider, Major Taylor occured. Taylor, at that time was a member of the Zig Zag Bicycle Club, which had invited all the top riders to a special dinner. The meeting made a lasting impression on the 14 year old and inspired him into the sport of bicycle racing. However, this is also a time of racial segregation in the United States. In 1894 a group of Southerners managed to get the League of American Wheelmen to ban Black cyclists from becoming members. That same year, A.T. Lane became president of the Canadian Wheelmens Association. 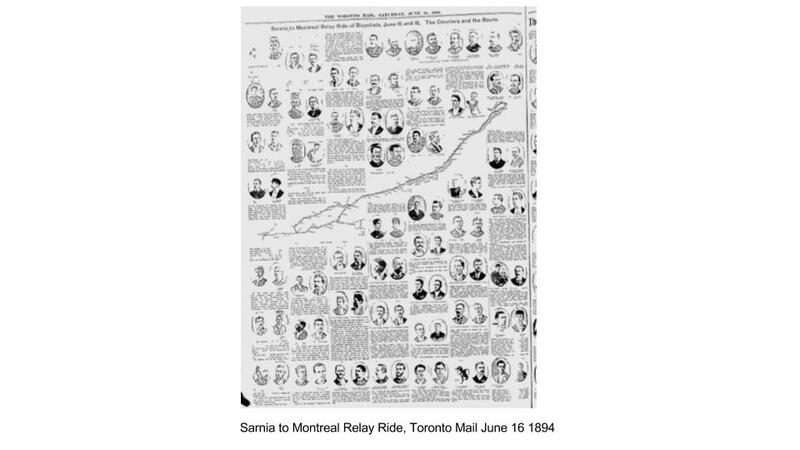 Montreal was to host the CWA annual meet and in order to promote the event he organised a Sarnia to Montreal relay ride. The relay riders carried a letter, passed from one to next, requesting better roads and which was signed by mayors along the route. The ride was accomplished in 33 hours. 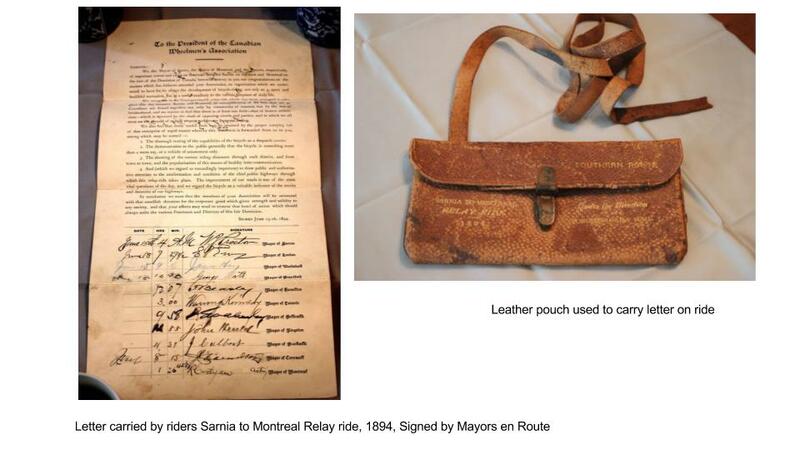 Don Houston allowed me to photograph the letter carried and along with the original leather pouch used. For the annual Meet a commemorative booklet entitled “Our City, Our Sports” was published. It gives a history of Montreal and Sports that era, a poem praising Montreal written by future mayor of Westmount W.D. Lighthall, a custom printed detailed map of the city as well as many pages vintage bicycle and travel related advertisements. A.T. Lane had left a newspaper clipping of his son’s Bertie obituary in his personal copy. In 1897 the Canadian Wheelmens Association sent a delegation to Glasgow Scotland in a to bid hold the ICA World Championship in Canada, After the first World Championship in Chicago, all others had been held in Europe. It was felt that it was this side of the Atlantic’s turn once again. They lost the bid to Austria, but Sturmey agreed that if Canada sent a cycling team to Vienna in 1898, the 99 world championship would be held in this country. The effort of organizing to send a team, selecting a venue and hosting the event was spearheaded by Louis Rubenstein, a Montreal Bicycle Club Member, CWA President and former figure skating world champion. Or fancy skating as it was known at that time. The cycling world’s organizations which had boomed in the early part of the 1890s’ began to unravel in the later half of that decade. In the United States disagreements arose between racing promoters and the overall LAW over how a professional racing should be handled. Racing interests founded a rival National Cycling Association in 1898. Both organizations had a racing circuit and professional racers had to choose which circuit to join. Major Taylor, a Black up and coming racer choose the LAW circuit despite the fact he was barred from actual membership within that organization. In Canada, disputes between Toronto and Montreal over who which city would host the championship developed. 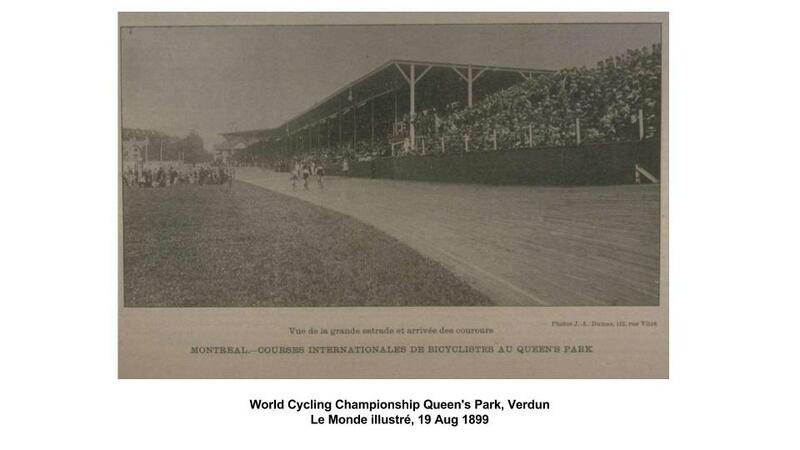 Montreal’s case was strengthened when a new outdoor wood Velodrome was constructed in Verdun by Ucal Henri Dandurand. Ultimately this Velodrome could hold approx 10,000 spectators. 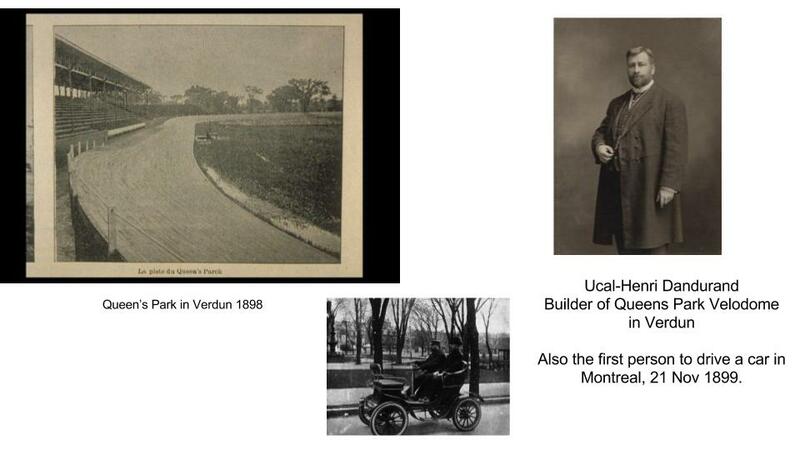 Later, Dandurand was also the first man in Montreal to own an automobile. In Europe disputes developed between France and Sturmey’s ICA over how many votes should be allocated to British Empire countries such as Scotland and Wales vs the single vote given to France. 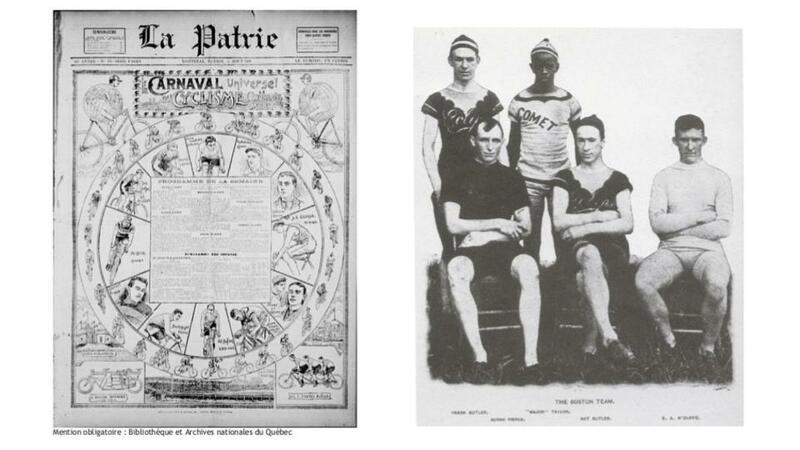 All these forces came to a head when the 1899 Cycling Worlds Championship held at Queen’s Park in Verdun. The press was filled with speculation as to which American racers would be permitted to compete the LAW or the NCA? Sturmey, who had travelled to Montreal for the event, held a meeting in the Windsor Hotel, a few days before the championship. He decided in favor the League of American Wheelmen. 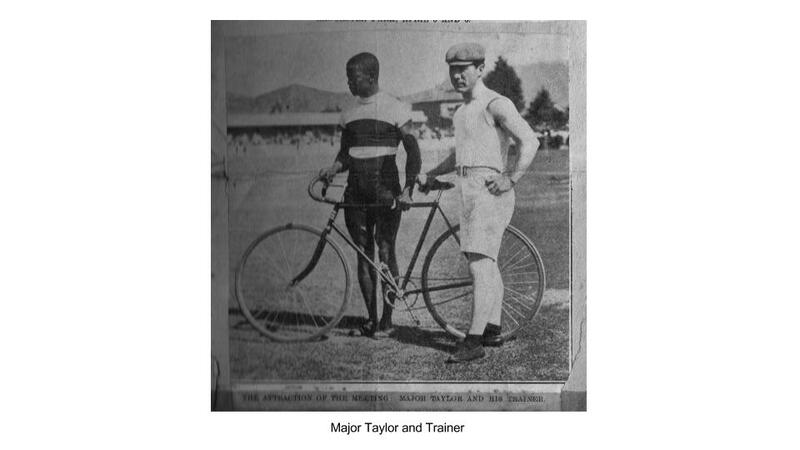 This meant that Major Taylor, who had just set a new world sprint speed record was the favorite along with the Butler brothers of Boston for the highly contested 1 mile professional sprint. At one of the preliminary races it was widely felt that Major Taylor had won and yet the judges ruled against him. This caused a large uproar in the crowd. However Taylor accepted the judge's decision like a gentleman, earning him much praise. Taylor went on to win the sprint 1 mile professional title becoming only the second black man in history to be a world champion in any sport. The praise he received for accepting the earlier judges decision soon turned to scorn from Sturmey however. Taylor refused to compete in the traditional match race between between the champions of the professional and amateur divisions. He felt that he had much to lose and nothing to gain from competing. 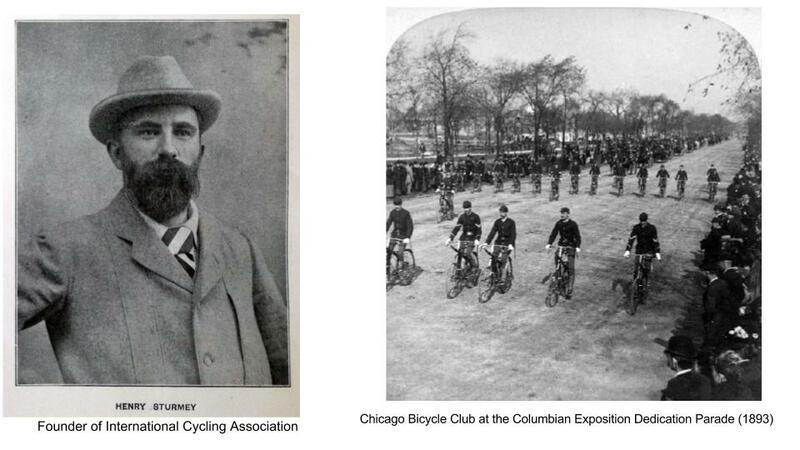 cc In 1900 the League of American Wheelmen turned over all racing aspects of cycling to the National Cycling Association. 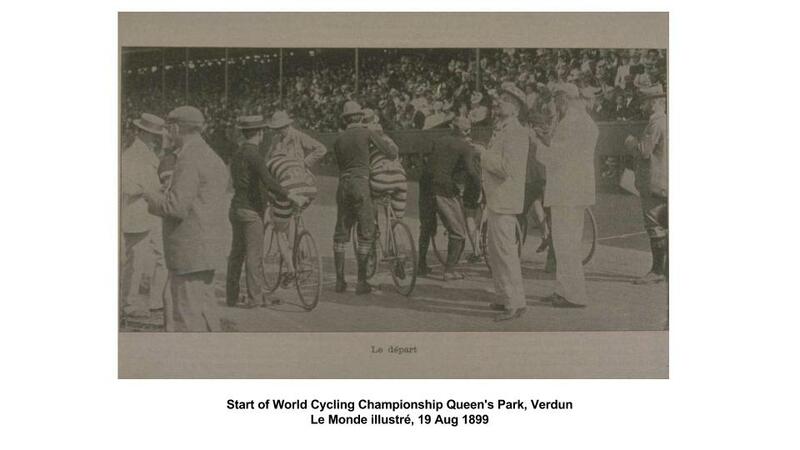 Although not known at the time, the Queens Park 1899 ICA world championship in Verdun was a watershed event. It was the last time the world championship was held by that organization. In 1900 the ICA was torn apart over arguments on amateur vs professional racing and the voting assignment of different countries. In 1901 its role was taken over by the Union Cycliste International (UCI) based in France and continues to this day. Cycling organizations in Europe did not decline as they did shortly thereafter in North America. were replaced by the American Automobile Association which was founded the same year. The CWA gradually faded away about the same time, its last annual Meet was Winnipeg in 1898.
club continued on in a diminished form until the first world war. When the war ended surviving members did not restart the club. Bicycle sales remained strong in the early 1900’s but the bicycle’s founding organizations which had boomed during the bicycle craze of the 1890’s went bust. Bicycles as a primary mode of transportation in Montreal were not replaced by cars as popularly thought, but rather the electric streetcar. 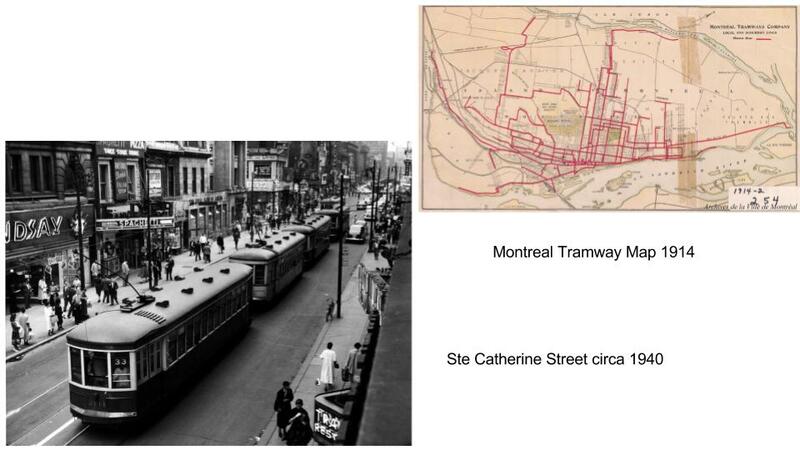 It was by trolley that the majority of Montreal trips were made until after the second world war. The streetcar rails were removed by 1959 to allow more space for automobiles. Today bicycle infrastructure is much more developed in Europe than North America. Perhaps if these early North American bicycle organizations had not disappeared, North American and European cities would have been more similar today?